Dedicated to all those affected by the recent events in Paris, this show is also a celebration of the Royal Ballet founder’s extraordinary versatility as a choreographer. Was there ever a dancemaker who understood the workings of the human body better than Frederick Ashton? He seems to have divided the dancer into two separate halves, the torso and the legs, created independent movements for each and then put them back together. Thus, the fluid elasticity of the upper body and the perfect elongation and graceful flow of the arms work in harmony with the fleet and rapid footwork. This is very much apparent in Monotones I and II, in which lack of ornamentation keeps the focus on the three dancers clad in tight Lycra costumes. Every nuanced gesture is exposed, every delicately poised position open to scrutiny. It’s fiendishly hard and Monotones I suffers from uncertainty. The trio in the comparatively aerated Monotones II seem far more confident, with Edward Watson and Valeri Hristov supporting Marianela Nunez in a magnificent and complex series of turning lifts. In complete contrast to the stripped-down, Satie-driven Monotones, The Two Pigeons is a ripe and colourful romance, full of lyricism and staged with extraordinary fidelity by Christopher Carr, who danced in the ballet in the 1960s. The relationship between a young painter and his girlfriend/model who won’t sit still is beautifully established and riddled with humour. Lauren Cuthbertson has rarely been more attractively airheaded, as she prances and fidgets her way out of Vadim Muntagirov’s affections. Laura Morera makes a fine, Carmenesque gypsy who tempts the artist away from his true love. 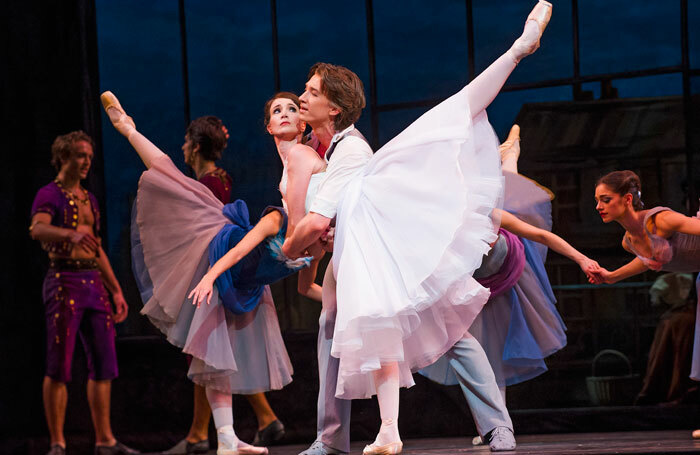 The corps de ballet delivers a vivid account of the gypsy camp, which has the fiery exoticism of Michael Fokine. Marcelino Sambe’s radiantly muscular solo is outstanding. Jacques Dupont’s set, with its huge picture window and vista of Paris, frames the production in epic style, allowing the extremely well-trained doves to fly on and off without a hitch. Lovers reconciled. Pigeons on cue. Job done.